The 878 men of the First Battalion, 25th Marine Regiment who came home have struggled to come to terms with the fact that 11 did not; that 68 others suffered combat wounds; and that many more were hit with injuries less visible but with long-term effects. Part 1: Coming Home After a long tour of duty in Iraq, the first battalion 25th Marine regiment returned home. Part 2: The Roulette Wheel Three were killed and three wounded during the longest day for the battalion. 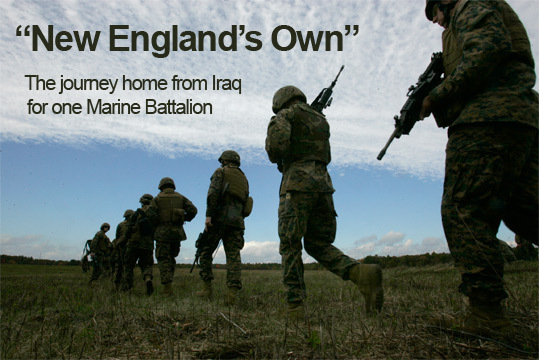 Part 3: Moving On The Marines of "New England's Own" struggled with life back home after Iraq. For years after returning from Vietnam, George Burke kept his distance and held his silence, a remote and angry presence for his family. But suddenly, survival depends on confronting something he and his son share: Both have been diagnosed with post-traumatic stress disorder. Are you a New England veteran or do you have a story to share about one? Post it on this message board. Or contact Boston Globe reporter Charles Sennott with a private e-mail (sennott@globe.com), or call him at 617-929-7671. Homepage for the federal agency. Free counseling and outreach services for veterans and their family members. A report on the long-term costs of providing medical care and disability benefits for soldiers returning from Iraq and Afghanistan.